One in four Americans die because of heart disease, according to the Center for Disease Control and Prevention (CDC). And, yearly, 785,000 Americans have their first heart attack in addition to the repeat heart attacks of the 470,000 who had one or more already before. Clearly, the hearts of many Americans are in need of taking care of. There are risk factors of heart diseases that are preventable and reversible. Some of these risk factors are increased low–density lipoprotein in the blood, high blood pressure and obesity. One thing that may help with retarding these risk factors is adding chile in the diet. Increased levels of low-density lipoprotein cholesterol (LDL) in the blood can lead to cholesterol depositing in arteries that causes these arteries to narrow. Eventually, this may lead to a full-blockage of the artery, which is the Myocardial Infarction, better known as Heart Attack. Chile may help in preventing this from happening because eating chile enhances the processing of cholesterol in the body. Studies have shown that capsaicin (the component of chile that makes it spicy) can decrease the absorption of cholesterol and increase the amount of it excreted in the feces. And other studies have shown that the constituent of capsaicin called dihydrocapsaicin has the capability to decrease blood levels of low-density lipoprotein cholesterol (LDL) and increase the high-density lipoprotein cholesterol (HDL) levels which is the “good” cholesterol that gives the body protection against heart diseases. High blood pressure, also known as “The Silent Killer”, is a disease itself and is also a major risk factor for heart disease. Constant high blood pressure can cause the walls of arteries to become stiff and inflexible. The damaged parts of the artery can cause white blood cells, cholesterol, and other blood components to accumulate in the area, forming into a plaque. The plaque can become bigger and bigger as more components accumulate until it fully blocks the artery resulting into a Heart Attack. To help prevent this from happening, adding chile in the diet could help decrease the blood pressure. The capsaicin of chiles causes vasodilation that opens blood vessels enhancing the blood circulation, and lowers blood pressure. Moreover, chile is rich in vitamin A, and this vitamin has the capacity to scrub away plaque in blood vessels. Furthermore, adding chile in the diet can help the blood flow through vessels easier. According to a study where chile was included in a meal or was held in the mouth temporarily, the results has shown that it caused the decrease of the blood-clotting mechanism. There are 60 million Americans, 20 years and older who are obese and another 9 million obese children and teens with ages of 6 to 19. Obesity is a major risk factor not only to heart diseases but also to cancer and type II diabetes. It can lead to a heart disease because it strains the heart in trying to pump blood throughout the obese body which has more body mass than normal, and this leads to increased heart rate. Obesity more commonly causes high blood pressure because the fats causes constriction of blood vessels and it strains the heart even more in trying to push blood through the blood vessels. The overworked heart of an obese person more likely will go into cardiac arrest. In preventing all these things from happening, a serious amount of exercise, lifestyle change, and diet change are needed. To make the diet change more effective, adding chile is very beneficial and is also great for the taste. Chile can help obese people lose weight because it can increase the metabolism of the body. C.J.K. Henry and B. Emery, researchers at Oxford Polytecnic in England, have found that chile can boost the body’s metabolic rate through the result of their 1986 study. It works by the chiles triggering the thermodynamic burn that may last until 5 hours after eating. This is called metabolism which allows calories to burn and prevents the fats to form, thus helping in losing weight. Adding chile to meals is not only very delicious but it is very healthy too. With all these benefits that chile can give the heart. 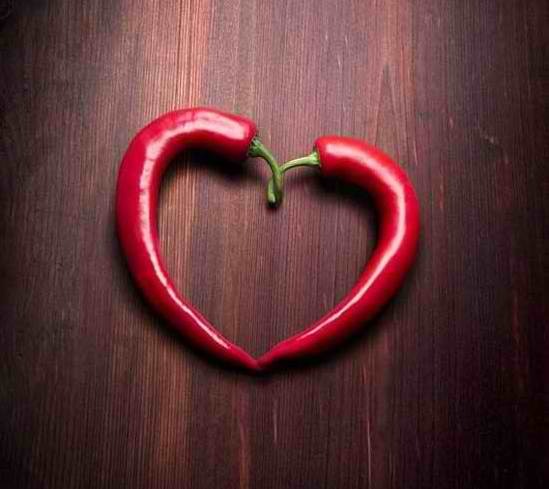 It is obvious that the heart loves chile.